8...Qa5 9.Qd2 0-0 10.Rc1 Rd8 11.d5 e6 12.Bg5! 20...Kh8 21.Qxg5 Rf8 22.Qxf6+ Rxf6 23.Ne5 Rf5 24.Nxc6 Nxc6 25.Rd1 Rd8 26.Rh4! 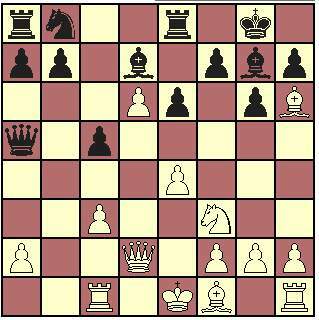 4.Nf3 Bg7 5.Qb3 dxc4 6.Qxc4 0-0 7.e4 a6 8.Be2 b5 9.Qb3 c5 10.dxc5 Bb7 11.0-0 Nxe4. 21...Bxf3 22.gxf3 Rfe8 23.Bd6 Bf8 24.Bxf8 Rxf8 25.Rd6 Qa3! 46.Ra3 d4 47.Ra8 Rc7 48.Kf1 Ke5 49.Rd8 f5 50.h4 Rc1+ 51.Kg2 Rc6 52.Re8+ Re6 53.Rd8 Rd6 54.f4+ Kd5 55.Re8 Re6 56.Ra8 d3 57.Kf3 Kc4 58.Rc8+ Kb3 0-1. 2000 - 2003 http://www.chess88.net , All rights reserved.